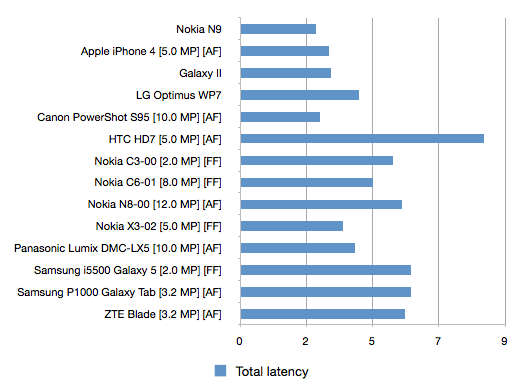 Nokia N9 faster at taking photos than iPhone 4 (& every other camera phone on the market!) N9 next month? There’s an article over at Nokia Conversations making the rounds on the blog showing the speed of the Nokia N9 camera in relation to the competition. The article isn’t really just about this but this is what has caught people’s attention – the speed at which from starting the camera to taking the photo – the Nokia N9 beats not just every single camera phone but the Canon PowerShot S95 – a dedicated digital camera. This has caught the attention of Vlad who has posted yet another two articles that are PRO Nokia N9. Go figure. #paranoidhat says it’s inevitably a way to dig at Nokia (future main focus is WP7, plant seeds of hate early :P). This needs more thought to start this sort of discussion though. Whilst we’re on the topic of N9 camera, some other things I found interesting about the camera: Yesterday we read some of Damien Dinning’s N9 Camera Tweets. I thought that unlike a 12MP 4:3 shot that’s converted to 16:9 9MP, the N9 has 8MP 16:9 and 4:3. I think I may have misinterpreted the meaning of TRUE. Perhaps it means that 16:9 isn’t simply a 4:3 cropped image? Feature-wise, there’s the continuous auto focus, , geotagging, dual-LED flash, automatic motion blur reduction, face detection and exposure settings of various types. No camera key, it’s just touch. Yay iPhone 🙁 Nokia calls it softkey. Helps folks who don’t know how to use a camera button I guess. Oh and Sam has found another slashgear article that suggests the N9 being available next month. Cheers Adnan, Sam, Prasanna, Don and Rock.